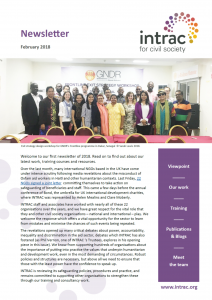 Our first newsletter of 2018 brings you up-to-date on a number of projects we have been working on, as well as details of our forthcoming training courses. We have a viewpoint from Phil Vernon, INTRAC Trustee, on promoting collaboration between people, not just organisations, in improving cooperation between international and indigenous civil society. There is also information on the March issue of Development in Practice, along with details of the upcoming special issue (which will be available in April). Along with all of the above, we have a guest blog from Mireille Abi Khalil, an independent consultant from Lebanon. Plus, a blog by Helen Mealins and Rick James on investing in national consultants to strengthen civil society, published in the Alliance Magazine blog. INTRAC’s Newsletter is kindly sponsored by Routledge Taylor & Francis Group.